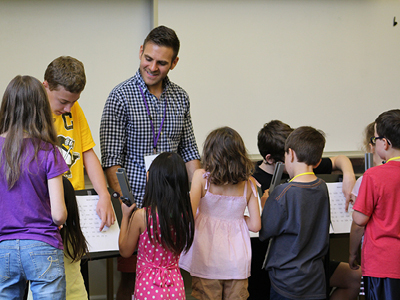 Sunday Adventures in Music (SAM) is a comprehensive music training program for children. For more than twenty-five years, SAM has given us an opportunity to teach children the skills necessary to participate fully in the musical life of the Christian church. We seek to help children develop their singing voices, teach them basic skills in music literacy, and introduce them to varied traditions of sacred music from around the world. We are pleased to have included a number of children from the community on our past rosters and are always eager to reach out to new friends. The Bethlehem Choir is a training choir for children in kindergarten through second grade. Their performances are generally in comfortable settings, such as church dinners and a nursing home. They also help the Nazareth Choir lead in worship on Christmas Eve, Palm Sunday, and Good Friday. The Nazareth Choir (grades three through five) is the Shadyside Presbyterian Church children’s choir. The children serve as music leaders in Shadyside’s worship service six or seven Sunday mornings each year, as well as Christmas Eve and Good Friday. Choristers also have the opportunity to participate in the Pittsburgh Choristers Guild Annual Children’s Choir Festival in March. In addition to vocal and choral training, the children often accompany themselves using drums, xylophones, glockenspiels, and other rhythm instruments. The older children also learn the basics of choir chime and handbell ringing. The appeal of these instruments provides additional motivation for children to learn to follow the shape of a melody line and read simple rhythmic patterns. SAM incorporates rehearsals into a slightly extended Sunday morning. The Nazareth Choir begins with singing “second hour” (approximately 11:15 a.m. to noon) and continues with chimes/bells from noon to 12:40 p.m. A snack is served in between. The Bethlehem Choir rehearses from noon to 12:40 p.m. Rehearsals are not held on Communion Sundays (generally the first Sunday of the month), so that older children may remain in worship. Each semester, children receive a CD of their repertoire to take home. Opening Music at 9:30 a.m. Four-year olds through fifth graders gather in the Nazareth Room (the large Christian education classroom on the lower level of the church building) to share Sunday school favorites and at least one of our morning hymns. Sunday school songs are available on an audio CD – please ask for a copy.